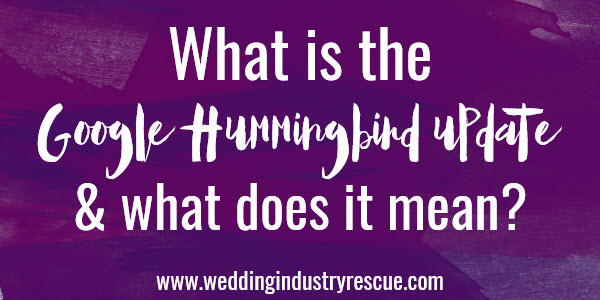 What does Google Hummingbird Mean for my Wedding Business Website? If you have a website or a blog, you have probably heard about Google’s new algorithm update, Hummingbird, that was announced in September of 2013 (but actually started about a month before, according to Google). And if you care about your website’s search engine optimization (SEO) you have tried to figure out how this new change applies to you. As is typical with all changes in things we grow used to, no sooner than the change began, the panic set it. And it was partially fueled by SEO bloggers (intentional or not) freaking everyone out and partially fueled by the fact that most people don’t have a clue how SEO works in the first place. And adding changes to something they already know nothing about is even more frustrating. I have yet to have a conversation about the Hummingbird update where someone doesn’t say, “oh, you can’t do that now”, and they’re wrong! The Hummingbird update is nothing to be feared. Just like everything else in life, things change. And they often need to. People’s habits change. They make different choices. And as companies work to make their customer’s experiences better, they adapt their systems to better serve them. And this is no different for Google and their Hummingbird update. Google says Hummingbird stands for “precise and fast”. And that makes sense. They want their users (the general population) to be able to type something into their search engine and find the info they are seeking quickly and accurately. The way that people search for things online is a very interesting thing. Just think about the way you most recently used Google. Did you type in “wedding photographer Chicago” or did you type in “who is the Chicago wedding planner that was on Style Me Pretty last month”? Chances are, you typed in something that was more like that last comment. That’s what Google considers “conversational search”. And they are paying a lot more attention to each of the words in this type of search. Where they used to focus mainly on the actual keyword or keywords, they are now looking at all of the words on each side of the keyword and how each of those words apply to the search that person is actually making. Basically, they are concentrating on the “conversation” you are having on line to better connect you with the right search result. What can affect your search results? Things like your physical location at the time of the search, where you live, and what Google already knows about your habits, all affect your search results. Their goal is to provide results that actually answer the question being asked. But we don’t know everything about how Google comes up with the answer to your specific search, because that algorithm is kept super secret with Google. Does this mean the death of SEO? Nope. Does this mean that I’m going to lose a lot of traffic to my website? Well, if you haven’t yet, then you’re probably not going to. Hummingbird has been going for several months now. See, no need to panic. Do I need to change anything on my website as a result of the change? That’s a yes and no. If you built your website to hit a bunch of keywords and it reads like your car’s instruction manual, then YES. Chances are, you’re probably not doing very well with your site anyway with this method. If your website was designed to help your customers, has a blog that you regularly update, has great resources, and feels like you’re having a conversation with your customer, then you’re doing it right already. How can you better embrace the Hummingbird update? –Providing original and engaging content is always a winner and will continue to be so. And, in my opinion, the best way to make this happen for you is through a blog that best reflects your personal and business style and speaks clearly to your ideal client. -Videos are still going to be big. If you’re not using video on your site, you really should be. -Don’t do anything stupid! Just like with search engines in general, don’t try to game the system. Work with the system. Just like crazy things like linking schemes (read about those here) you might think you’re helping yourself but you’re not. -One of the places on a website that I think is often overlooked is the Q&A page. If there was ever a place that you could be conversational, this is it! And it’s also a great place to interject your unique personality on your website. Again, think about what an actual client would ask you in an appointment setting. And then write the answer to that question. 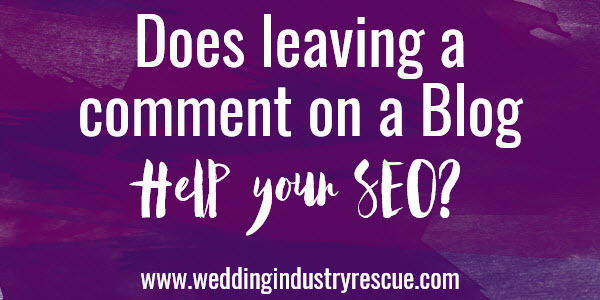 Because if they’re asking you, they’re probably going to type it (or talk it) in to a search engine. And when they do, hopefully they’ll find you! Have you made any adjustments to your website or blog as a result of what you’ve been hearing about the Google Hummingbird update? Tell us about it in the comments section below. Such great advice! Thanks for sharing Cheryl. Great advice! I’m always looking for ways I can improve, and I love reading your posts! I honestly had no idea about this update!! Thanks for the information. With incorporating video–is there one route to take that’s better than another? Ie- YouTube vs Vimeo? Etc? First of all, I hate Vimeo. For me at least, it loads very slow and needs to buffer often. I know a lot of creatives use Vimeo because of the better quality compared to YouTube. However, there is another AWESOME alternative that I see more and more people switching to and it’s a company I am starting to use. They are called Wistia. It is a paid hosting service but the quality is awesome, the load time is fast and they have built in SEO as well as all kinds of great features! They are reasonably priced and well worth it. Here is a link with some info. http://wistia.com/learning/video-seo Check them out. 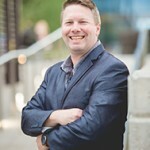 I can never get enough info on SEO and google and ranking and internet and market. Thanks for the rescue!! Interesting! Thanks for all the great info! Thank you for sharing! 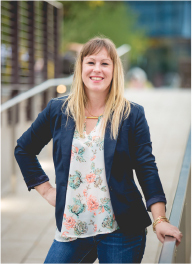 This is SUCH important info for businesses to know! I love the conversation analogy! SEO is like black magic sometimes. This is really helpful information. Thank you for putting it together and sharing it. Wow, tx for this. I haven’t heard of Google Hummingbird. Tx for the great info. Wow, thanks so much for all this info! This topic came up in a Facebook group, and it made me really nervous. But now I know the answer and I’m not scared anymore. I also check out that commenting link that you posted and that made me happy, too. You rock!! I’ve heard rumblings, but haven’t thoroughly looked into this yet. Thanks for the informative post! Great post!! Thank you for all that info!! Will be adding a Q&A page for sure!